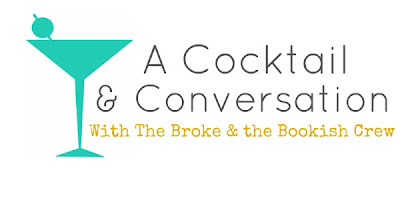 The Broke and the Bookish : A Cocktail & Conversation -- Where Would You Live? A Cocktail & Conversation -- Where Would You Live? I'd live in Greece. I currently live in the third largest city in Kentucky (which really isn't saying much). I'd live in Greece for so many reasons, the biggest being the history of Greek Mythology and politics that started there. I am a HUGE fan of pretty much every different cultural mythologies, but Greek is my favorite. I would sit where so many infamous and most influential people in the world have sat. I would stand in the middle of the Epidaurus Theater with my jaw dropped. I'd visit the Beaches of Crete and stare in amazement at the colors and pure beauty of the world. I'd walk through the Delphi Runs in splendor of the old world architecture. Okay, this is totally boring, but... I would live right here in Utah. My family and friends, as well as the Mr. 's family and friends all live here. (And yes, we like them!) So staying here is the dream... Especially if we had a house with a nice big back yard and beautiful old trees. Then I would travel EVERYWHERE. Ideal unattainable dream is unlimited money and to live literally every country for a month or so. But when I was in college I did the math against the countries recognized by the UN and if I had started right then it would have taken me decades. And that doesn't even count things like Scotland or Quebec vs. British Colombia or something. What about you guys? Where would you ultimately want to live? Anywhere there's a beach and an ocean. Failing that by the side of a lake with no people. Oo, I've been asked this before and the answer is totally Wellington, New Zealand. It's my fav city in the world. It's a little far for communication and visits, which is why of course I'm also learning how to teleport in my free time. Greece is nice too though, and Delphi was fun cuz there are little tunnels in the ruins you can explore. London. I was born there, but moved because my dad was in the Navy. I've lived in lots of places and got a chance to live in London again when I was a teenager. It was one of the happiest times in my life, and if I could choose anywhere, anywhere, to make a new life London would be it. I'm from Houston, Texas. I love Texas...that will always have my heart. But, I did it. I moved somewhere halfway around the world and have lived in Sydney, Australia for 6+ years.